Heat oven to 350 degrees F. Lightly grease a 9″ x 9″ baking pan or casserole dish. Spread half of the diced potatoes in bottom of pan. Place the diced chicken breasts evenly on top. Season chicken with 1/4 teaspoon each salt and pepper. 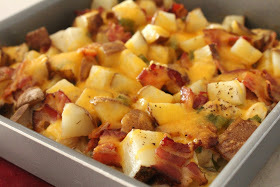 Sprinkle with half the bacon crumbles, 1/2 cup of the cheese, and half the green onions. Spread the remaining diced potatoes on top, followed by the remaining bacon, another 1/2 cup cheese, remaining green onions and another 1/4 teaspoon each salt and pepper. Pour heavy cream over top of casserole and then dot with the butter. Cover with aluminum foil and bake in the preheated oven for 1 hour. Uncover and bake another 30 minutes. In the last few minutes of baking, sprinkle with the remaining 1/2 cup cheddar cheese and bake until melted. Serve.